Microsoft has been running anti-iPad commercials left and right, but the company is now offering to take "gently used" Apple tablets out of customers' hands in exchange for a gift card. This isn't because Microsoft is suddenly digging the iPad. Instead, it's further digging at the chief rival of its Surface RT and Surface Pro tablets through an in-store trade-in. The minimum $200 (about £126, AU$215) Microsoft Store gift card promotion applies to the iPad 2, iPad 3 and iPad 4, according to the official Microsoft trade-in page. So far it is valid in the U.S., Puerto Rico and Canada. Microsoft suggests spending that gift cards to "upgrade your tablet" to the Surface RT at $349 (£279/AU$389) or Surface Pro at $799 (£639, AU$899), although the credit can be applied to anything, including the Xbox One. Microsoft's trade-in offer of a minimum $200 gift card to one of its stores is a little vague. That's because it depends on the condition of the used iPad as well as the model. Taking a look at the minimum values of iPad trade-ins across the web, Microsoft's initial bid actually seems reasonable. Gazelle is promising $150 (about £94, AU$162) for the WiFi-only iPad 2 in "good condition." This is the model that is likely to fetch the minimum $200 gift card to the Microsoft Store. Microsoft will probably pony up more for the iPad 3 and iPad 4, which are going for $160 (about £101, AU$173) and $220 (about £139, AU$237) for WiFi-only versions on Gazelle. Amazon, one of the best places to trade in an iPhone right now, lists iPad 2 as selling for $240 (about £151, AU$259) , iPad 3 going for $320 (about £202, AU$346) and iPad 4 topping off at $400 (about £253, AU$432). What happens to the traded-in iPads? Microsoft is offering a good deal if you're looking to buy one of the company's products and aren't willing to sell an iPad yourself on Amazon. But the question remains: What happens to the traded-in iPads once Microsoft is in possession of them? Does it really want to put its competitors tablet out back on the market? We posed this question to the company and are waiting to hear back. 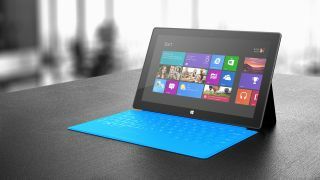 Good for Surface 2, too? Microsoft's trade-in program expires on Oct. 27, more than a month after the company's expected Surface 2 launch event on Sept. 23. Early adopters could take advantage of having the latest and possibly greatest technology. Though, there's always the strongly rumored iPad 5 around the corner in October to get them to stay within Apple's walled garden. See leaked Kindle Fire HD 2 photos, a third player in the tablet war.